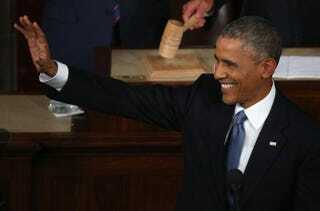 President Barack Obama waves before giving the State of the Union speech before members of Congress in the House chamber of the U.S. Capitol Jan. 20, 2015, in Washington, D.C. In his next-to-last State of the Union, a revived and unmistakably ultradefiant President Barack Obama let loose a post-midterm-election liberation song on a chamber of fattened Republican majorities in the House and Senate. Even with the somewhat humbled plea for “better politics” by the end of an hourlong speech, seemingly dire political realities were ignored for the night. There was little hint of scuttled legislative opportunities over the next two years. Instead, the president presented an ambitious populist remix, a “middle-class economics” lyric, and legacy counteraction to Reagan’s “trickle-down economics” that left congressional Republicans seething well after a flat, but pulled-it-off, response by Sen. Joni Ernst (R-Iowa). The president of the United States flexed. Free community college. A long-sought-after solid on child care. Individual tax cuts. Guaranteed health care. Higher wages and seven days of paid sick leave. This was, indeed, the we-can-get-with-that speech. So, 2014? That’s something for congressional Democrats to worry about. They didn’t want him on the campaign trail, anyway. And shade on the low-turnout rest of you who voted for the wrong folks. So, look at me now, says the president. I’m polling near 50 percent and running circles around you while at it. This was an incredibly middle-class speech. If there’s one place the president wants you to be, it’s in the middle class: He mentioned it about seven times. While the prognosticating jury is still out on the awkwardly cobbled phrase “middle-class economics,” this SOTU scored new points on the political board as it laid out a vision for new American prosperity in the postwar, postrecession era. “[It’s] the idea that this country does best when everyone gets their fair shot, everyone does their fair share, everyone plays by the same set of rules,” said the president, pulling from old rhetorical beats used countless times over the campaign stump. But if you’re poor … Not that he doesn’t care about the poor, but he sure didn’t mention it during his cheery we-got-jobs assessment. “Poverty” was mentioned once—but only in the context of global challenges rather than street-side woes here at home. And “low income” got a nod, but not without “middle class” in the same sentence. We get it: The White House won’t throw ice buckets on a revved-up-economy message when it’s resonating so well with folks on Main Street. The president won’t talk about depressed incomes or the growth of mostly part-time and low-wage jobs or a persistently high poverty rate. You can’t inspire a nation with that kind of language. But the president definitely doesn’t want anybody stuck there, hence an attractive middle-class-entry fix-it kit of higher wages, free community college and enhanced child care that the poor and dispossessed can use, too. “War? Not my thing.” Just as hard is an upbeat, “crisis-has-passed” follow-up to restore confidence at home while folks are gripped with jitters over conflict zones abroad. Obviously, he can’t have Pharrell lay a “Happy Song” White House cut on it—the Islamic State group keeps him reaching for Tums at night; old-school hawks in Congress keep throwing heat on a historic deal with Iran; and Russian President Vladimir Putin just doesn’t know when to give up, even when his economy is crumbling in the face of Obama-imposed sanctions. Which made this part of the State of the Union particularly tough and, arguably, unconvincing on some levels. There’s sharp, renewed interest and worry on foreign policy, but this speech seemed eager to simply squish this in the middle because it had to—and only because some show of force on topics like the Islamic State group and attacks in Paris gives the president a little wiggle room with normally uncooperative Republicans. Taking the political map—and conquering it. In a new, very Republican Congress, red-state faithful are convinced they’ve got what it takes to retake the White House in 2016. But not so fast. This State of the Union was a glaring reminder that Obama likes to play the long game—and play it well. He’s probably not going anywhere, and he wants to dominate the entire political map while at it. In the meantime, he’s finding strength in a national-issues campaign through all the upcoming policy thick and thin. States like New York, California, Colorado, Texas and West Virginia were name-dropped like political Morse code for future battlegrounds. “I’ve watched Americans beat back adversity from the Gulf Coast to the Great Plains; from Midwest assembly lines to the mid-Atlantic seaboard,” said the president. There was lots of candy for the middle class, public vouches for veterans and outreach to white female voters who strayed from the Democratic fold. While it wasn’t anything for #BlackLivesMatter to scream about, the speech fit in needed nods to voting rights, Ferguson, Mo., and criminal justice, along with hints on police and community relations. Everyone under the demographic sun got something, if not everything he or she wanted, with the president clearly loading bases for the next Democratic presidential nominee up for bat.